Bullet Hell Breakout, as the title suggests, is a combination bullet hell and breakout game written for Ludum Dare 41. In Bullet Hell Breakout, you guide your paddle ship back and forth to keep the ball in play, while hitting the enemies that travel above you. 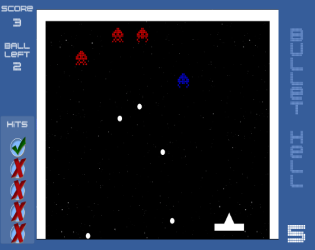 If you can hit the pink spaceship, you unleash bullet hell... the enemies now fire at you and you can fire at them! You have 3 paddle ships per game, and each paddle ship can take 5 units of damage. You can recover health units if you successfully guide the ball back to your paddle without incurring additional damage. In other words, you are rewarded with health if you can avoid more damage. Bullet Hell Breakout was written for Ludum Dare 41, which took place April 20 - 22, 2018.